“What??? But, but…….how can a wind instrument sound good without support?” That’s not what I’m saying at all. I’m saying we need to stop paying attention to “support” as a concept. Let me ask you a few questions. If I tell you to support your sound, what do you do? Can you explain what you are doing or how you are doing it? What is your definition for “support”? How do you explain “support” to your students? What do they do in their attempts to follow your instruction? First, my observations about flute students who have been told to “support”. Secondly, here’s my definition for “support”. Simply put, it is having body energy behind the blowing. It involves using abdominal muscles, pelvic muscles and intercostal muscles of the rib cage. In other words, its a full body activity. Rather than talking about “support”, let’s talk about blowing. If I say, “Blow fast (or faster) air,” do you understand what you need to do? Do you think students will know what they need to do if you give them that direction? If the air is moving sufficiently fast, the tone will be supported automatically. Support is the consequence of blowing quickly enough. All those supporting muscles are engaged in the process of blowing. You don’t need to “do” anything else besides blow with sufficient air speed to have a supported sound. Beyond blowing sufficiently quickly enough, there are, of course all the issues of finding the right placement on your chin, having the blow hole open just the right amount, shaping the aperture, blowing at the correct angle for the register you are playing and so forth. But a lot of these issues will largely take care of themselves if the student is blowing fast enough air to begin with. So encourage your students to blow faster air. Finally, air speed is different than air quantity. You can blow a lot of air through a large aperture and nothing will work well because the air isn’t moving fast enough. Not low notes (they will be wooly and unfocused), not the middle register because it will keep dropping down the octave, and not the third octave because it will either be so pinched as to not speak at all or keep dropping down to a lower partial. With the correct air speed and direction a flutist can play rich, focused low notes, have a clear, singing middle register, and be everything from heroic to ethereal in the third octave. It all starts with sufficient air speed. The rest comes through refining the direction of the air and sensitivity and flexibility of the aperture. As I frequently tell students, the tongue is used to start a note, rarely, if ever to end a note. So if there is a distinct “T” sound on the release, you are going to have some really nasty sounding note endings. Not to mention big problems single tonguing any faster than moderately slow. All that tongue noise from the tongue flailing around in your mouth isn’t tone. Or as my teacher Tom Nyfenger was wont to say, “Tonguing is the anti-tone”. Related to the tongue stop is the jaw drop release, which will slow you down even further. In both cases, you will get a distinctive popping sound on the release. If you hear a popping sound on the release, the first thing to determine is how the popping sound is being produced. It’s either going to be because of a “tut” style of tonguing or by dropping the jaw to end the sound. If you discover any other methods of creating this kind of release, please let me know. How are you going to address and correct this habit with your students? The fastest way is to have them do some kind of articulation exercise without tonguing! I use Reichert Seven Daily Exercises #2 (available on IMSLP), but any kind of scale or arpeggio exercise can be used. Start on an easy key like F, rather than a key that goes really low on the flute like D. Play each note with a forceful puff of air without the tongue. Keep the embouchure in position without opening the aperture after every note. If you observe a chewing type motion with the jaw, the student is involving more resources than are necessary. The less motion the better. Direct the students to think of still/poised rather than rigid. Have the students work on placing the air precisely for best tone on each note without the tongue. Learning to do this takes some practice and determination, because it requires real precision of placement for the best sound in every part of the flute. When you reintroduce the tongue, make sure the tongue is only involved in starting the note, not ending it. Also be sure to continue having the strong puff of air with good placement behind the tonguing. 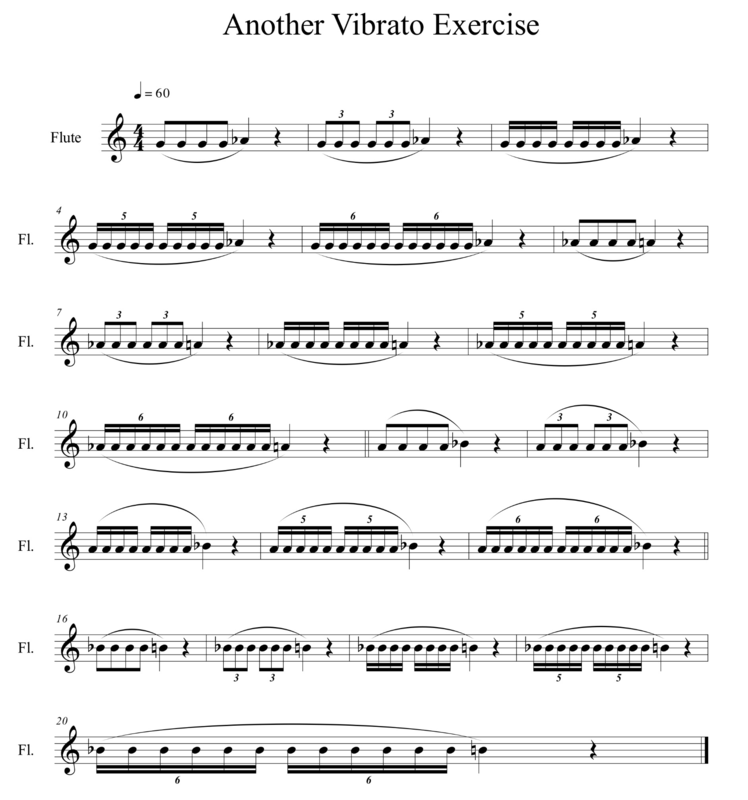 There are many additional ways you can vary up the exercise with different rhythmic patterns in all keys. Here’s a link to a video I did on various ways to practice good placement and tonguing. 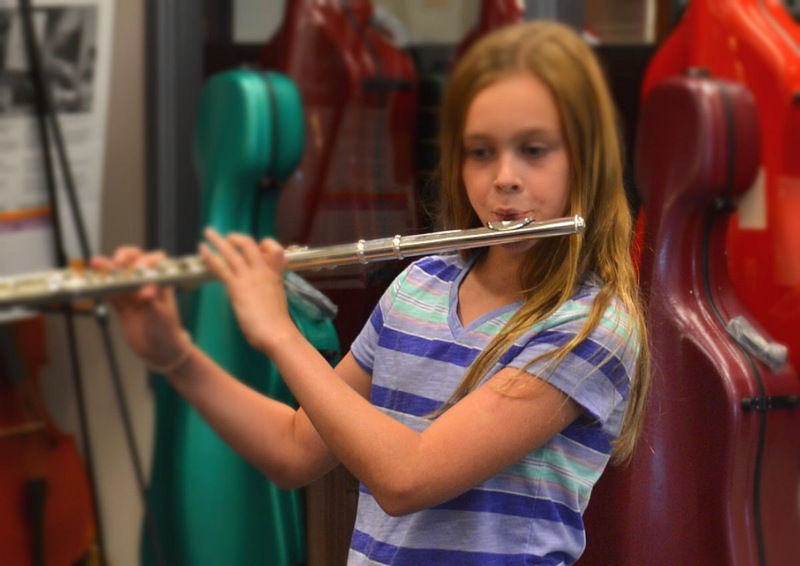 Balance of the flute and hand positions – if the flute isn’t properly balanced, then students develop all kinds of compensating behaviors to keep the flute from rolling back. Blowing – without steady air speed and pressure, the greatest finger technique is not of much use because we won’t hear what is being played. Coordinating fingers and tongue – have you ever heard a student try to play a fast passage while their fingers and tongue are out of phase? Even with decent finger technique, it isn’t very effective to be tonguing behind the ictus of the note. Knowledge of scales and arpeggios in all 12 keys – make it a priority that your students get beyond the keys of F, Bb and Eb. Help them learn to think in sharps for sharp keys and flats for flat keys. Get your flute students technical exercises just for them, or at least for woodwinds rather than brass. The venerable band technique books are either more focused on brass skills like lip slurs and/or are limited in scope in their technical exercises for flute. There are many excellent technique books specifically for flute that target the developing flute player, including books by Trevor Wye (The Practice Books) and Patricia George and Phyllis Avidan Louke (The Flute Scale Book). There are also great scale and arpeggio exercises in all keys and different patterns and note values (quarter, eighth, sixteenth notes) in the PC/Mac version of Smart Music. In Smart Music, you can assign scale exercises for assessment, set it to loop through the circle of fifths and change articulation patterns. Tone work is a vital part of technical practice. Please note that brass style lip slurs and Remington exercises may be useful in an ensemble setting, they are not particularly helpful in developing characteristic flute tone. For developing flute tone there is no better exercise than practicing octaves slowly. Students can focus on directing the air properly and pay attention filling the space between the notes with steady air. I recommend waiting until high school to introduce the Moyse long tones. The younger kids usually don’t have the maturity to understand how to explore tone, focus and continuity with the Moyse long tones. The important thing is to help your students develop good home practice habits that include regular tone and technical work. If kids are practicing 30-40 minutes a day, 10-15 minutes focusing on technique will make a huge difference in their skill set. First of all, tonguing is not articulation in and of itself. Or as my teacher, Thomas Nyfenger, liked to say, “Tonguing is the anti-tone”. Tonguing is a component of articulation, but it’s far from the main component. Many people think if you need an accent, you should just tongue more forcefully. I can’t comment on whether tonguing harder works for other winds and brass, but I can assure it is absolutely the wrong thing on flute. I can guarantee you the note will likely crack, not to mention sound rude, crude and unrefined. Remember, tonguing is not tone. And the flute embouchure is a lot more fragile than other instruments. If you’ve been reading this blog, you know that flutists have to both create the ﻿mouthpiece with the lips﻿ and shape an embouchure simultaneously to direct the air. Lips are more flexible than metal or hard plastic. If you tongue explosively behind the lips, they will flare and lose their ability to focus and direct the air accurately. You need to develop two different kinds of basic blowing, staccato and legato. Everything beyond that (including accents) is a variation of these two types of blowing. You can take any scale or arpeggio exercise and adapt it to work on staccato and accents. Set a metronome to mm=60 and play the exercise in eighth (quavers) notes. Play detached with breath accents and no tongue. This forces you learn how to shape the embouchure and aim the air precisely. Use forceful puffs of air using your abdominal muscles. When you have good control using a HA articulation, add the tongue. Just tip the note with the tongue and continue to use the breath to generate the articulation. At the risk of sounding preachy, I strongly believe we need to talk about the quality of articulation, never about attacks. Articulation implies defining and making things clear. Attacks, on the other hand, imply violence even though we aren’t using the word in that kind of context. I really believe if you talk to kids about attacks, they will tongue too hard. And for myself, I was a chronic over-tonguer well into my post high school education.